Intense 1-day Action Learning Workshop on fundamental skills required to be a successful CX and Employee Experience practitioner followed up with access to the Executive CX400 Series Online Courses. Designed for immediate application: We teach insights for innovation and skills for solutions. Courses so convenient: Online and on-the-go learning at anytime and anywhere. Your own experience design strategy: Custom training modules to teach your brand and message. Introducing a 2-part training program for organizations to kick their Employee Engagement and Customer Experience strategies into full gear! Deep Listening: powerfully effective, culturally relevant exercise. Empathy Coaching: building the capacity to enter into another’s world. Design Thinking: applying creative solutions to challenging problems. Fundamental CX Skills: an afternoon diving into the 6-Competencies of CX. Round out the training with easy-access Online Courses in CX. ECX400 Series: Executive Online Courses in CX created for the busy professional. Designed to be completed in as little as 60 to 90 minutes per course. 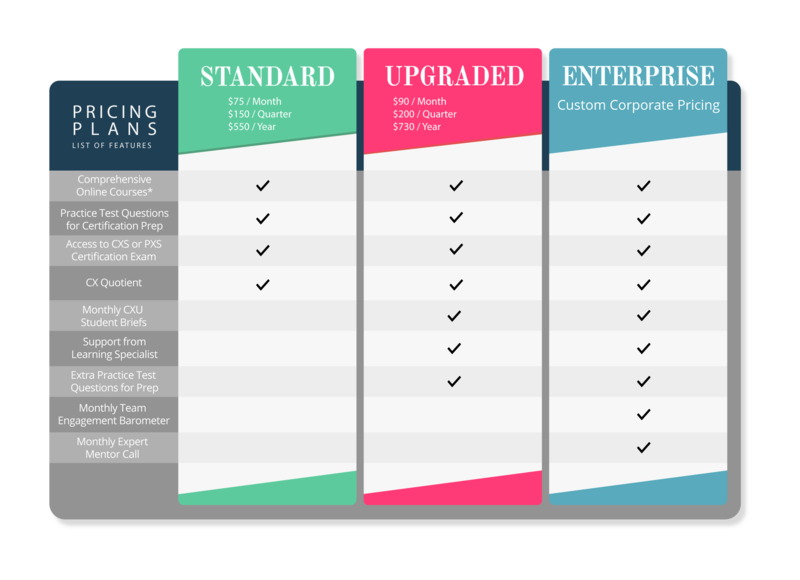 9-months access to all 6 Executive CX online courses. Reliant Energy is a subsidiary of NRG, a Fortune 200 company that provides electricity to a large segment of Texas and surrounding states. They serve over 1.5 million residents. CXU designed and delivered a two-day action learning workshop to align key internal stakeholders to the company’s CX program. Many of these stakeholders had never even heard about the CX discipline or its impact. A key goal was to get participants to collaborate across team/functional boundaries and lead CX initiatives at their team levels. They also wanted to ensure that the workshop learnings can be transferred to over 2500 employees so that there is a coherent CX map across all aspects of the company. A two-day workshop introducing participants to the six competencies identified by the Customer Experience Professionals Association (CXPA). Their VOC vendor was also incorporated into the workshop series to provide insights on their feedback system and metrics used to gauge their performance. A 25-minute eLearning Module for over 2500 employees, co-created by Reliant and CXU. A group of 17 stakeholders participated in the two-day workshop and agreed to initiate CX activities within and across their teams. 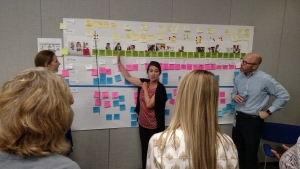 The workshop led to collaboration across silos and a convergent engagement of CX practices. The eLearning Module was used to train 2500 employees in the company’s CX vision and practice. The eLearning Module has been so successful in creating a culture of experience excellence that it is now used to onboard all new employees. CX University workshops are action-oriented, where participants learn by doing, transferring skills to the job for immediate application. Delaware North, one of the largest privately held companies in the Forbes list provides services in the gaming, food, and lodging services globally. 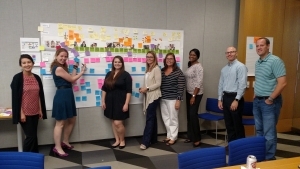 Delaware North’s key internal stakeholders needed a boost in their Customer Experience understanding to strategically impact their organization and improve their customer focused culture. CXU’s goal was to prepare the stakeholders to lead their teams into the future with a strong understanding of best CX practices and apply their knowledge to lead teams toward a higher level of commitment to their customers. A group of leaders enrolled in the 6 CXU Online Course Bundle. This allowed them to learn at their own pace and convenience. However, the team of stakeholders also asked that CXU provides a live workshop midway through the program to reinforce concepts and add new developments in the field. The project will cap with an end-of-program review in a live action learning workshop. Delaware North reported that the key stakeholders are successfully applying the principles of customer experience across all their business units in the US, UK, and Australia. Register learners in a subscription plan or purchase an annual package designed specifically to motivate and train an organization. Konica Minolta is a large, Japanese-based organization with locations in 50 countries. They have a goal to create new value for their customers by providing products and services by “Giving Shape to Ideas,” a pledge they have for their customers. Leadership wanted to reach employees in a large geographic segment of the company to provide training in their new CS Approach at the White Belt level. They wanted to be able to reach their audience for training through an eLearning module narrated in English but also with an option to provide opportunities to localize their training. In partnership with Konica Minolta, CXU co-created a 20-minute eLearning module intended to be delivered with English narrative. They also wanted to be able to localize the training through language translations. CXU provided the team with a second flexible module that could easily be translated into local languages, enabling the company to optimize their investment in training on CX. 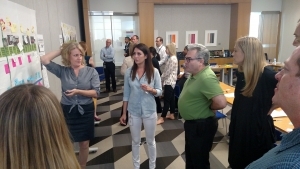 The training module on customer centricity was implemented across several countries in Europe and the US. In some cases, the module was revised for local geographic and cultural contexts. Konica Minolta reported that employees received the training very favorable with many stating that their perspective on the customer had changed- which was the primary purpose of the initiative. Work with our eLearning and Experience experts to create training modules for your team or organization. Your company logo, branding, and messaging seamlessly woven into learning modules. Include a leadership message and integrate as much or as little company policy, training topics, etc. as you like. Learn about CX and Design Thinking with our free eLearning demo! Logistical sense. Economical sense. Offering eModules across your organization will have a lasting professional development impact. Learners tune in when it’s convenient for them, limiting time away from their main responsibilities.